I will be making this for my Christmas dessert. Cover tiramisu, and refrigerate at least 2 hours (or up to 2 days). Dust with cocoa powder before serving. 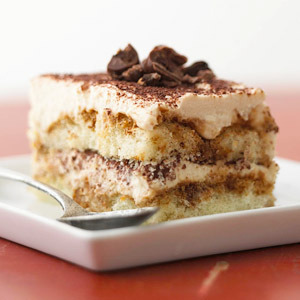 A tasty kid-friendly version of tiramisu! I used mascarpone cheese because I prefer it. I can easily find ladyfinger cookies in the cookie section of any grocery store, but you could also try an Italian bakery or deli, they usually carry tiramisu ingredients including ladyfingers. If you want to add coffee liquor, you could add it to the cream cheese mixture but this might make it runny, I’d put it in the cocoa water and soak the ladyfingers in the liquor mixture.